Building a garden each year doesn’t have to be cumbersome. You don’t have to till the ground, build raised beds, or even plant in containers. HOW? Straw bale gardens are where it’s at! 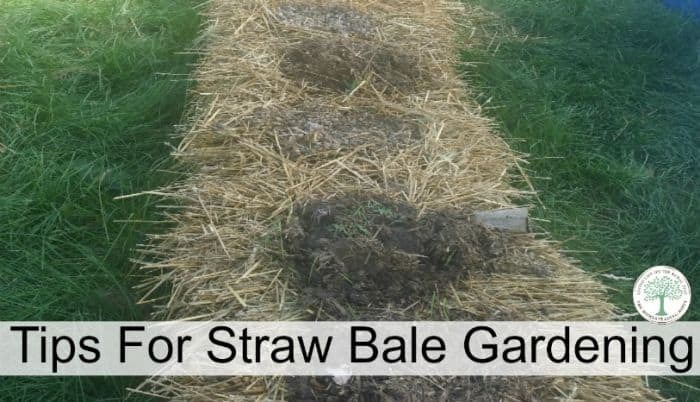 Straw bale gardening is a great way to grow a lot of plants in a small area, and it is perfect for those who are unable to dig the yard, but have some space for the bales. Straw bale gardening can be weed free. It also will require very little bending over to harvest. This makes it easier on the back and knees. I am going to share with you some simple straw bale gardening problems from the successes and failures we have had over the years. These things we had to learn the hard way, but they were lessons well learned. For the best chance of success at straw bale gardening, you need to get the straw bales several weeks in advance of planting. This allows you to completely wet them down and prepare them for planting. To prepare them, we take a garden hose and soak the bales until they are dripping with water. Cover them with plastic to heat the bales up in the sun. This helps to kill any mold in the bale that may be present. Rinse and repeat for several days, until the bale becomes saturated. We thought we could just buy the straw bales and plant the same day. They hadn’t mulched down. They also were not moist enough to support the roots of the plant. If at all possible, when straw bale gardening, try and source organic straw. There may still be contaminates on the straw from spraying the wheat fields that can get into your plants. It will cost more per bale and may not be available in all areas. When we can’t find it, as it’s not always available in our area, that is one of the things I choose for myself to “not sweat” over. Your choice. When straw bale gardening, keep the twine in place on the bale. This will help you keep the bales in place for the whole season. Otherwise, the bales can easily fall apart on you mid season as they compost down with the plants. When you are placing the bales for planting, make sure to pack them next to each other as tightly as you can for additional support. The second year, we cut the twine and wound up with tomato plants all over the place due to lack of support from the straw bale. Once the bales have been saturated and solarized, it’s time to prepare the tea. Straw bale gardening needs a good tea. Compost tea that is. Drill or dig a hole in the bales where you want to put the seedlings, making them about 4 inches deep. You’ll want to space the holes based on the plants you want to put in the straw bales. Use the same spacing you would any other method. Fill that hole with compost tea, comprised of either straight rabbit manure or a 1:5 ratio of chicken manure to water. Dilution is needed because the chicken poop can be higher in ammonia and kill the roots of the plants. Continue to water down the bales for another 3-4 days while adding compost to fill the holes. This will help create a place that will nurture the plants for you. Adding straight rabbit manure WILL help. But, it still needs lots of moisture to compost and feed plants. After 3-4 days of manure tea and continual watering down, the bales are ready to be planted. We put seedlings in the bales, but you can also directly sow seeds. Space your plants out as you would in the ground. Place a bit of potting mix in the hole, add the plant, and cover with more potting soil. Gently pack it around the stem of the plant to provide support. You’ll also want to put support structures in place BEFORE you plant the straw bales. For example, tomato trellises should be in place before the plant goes into the bale. This will avoid trying to fanagle it around the plant. Also, the support should go into the GROUND to hold up the plant, and not into the bale itself. As the bale is decomposing, it will not be strong enough to hold the plant and support. The best plants for straw bale gardening are anything you would want to plant in a regular bed. Tomatoes, peas, green beans, peppers and even squash all work well. Drip irrigation is important for consistent watering. The straw doesn’t hold water as well as the regular ground, so you will want to water the plants more often. We let soaker hoses run over the bales to help with that. After the growing season is over, remove the plants and use the left over bales to cover your other garden beds. Or, you can place them directly into a compost bin to create more compost for the next season! Straw bale gardening is fun, easy and will provide lots of vegetables for you! Have you ever tried straw bale gardening? What tips would YOU have for a beginner? Be sure to pin this for later! I used bales of spoiled Lucerne (alfalfa) hay. With all that extra nitrogen the plants went ballistic! Next season I will go again with this method but space everything further apart! Let me know how it works for you…I have never tried alfalfa hay before! Thanks for this write up on using straw bales! It was on my ‘B-List’ of things to get around trying out some day. I must say that I was surprised to see all the lead up time and prep work involved. It sounds like this would need doing each season with each new bale, so I’m not sure I see the time savings and convenience I assumed was the perk to this method. At least with my concentrated growing area and containers (free food grade buckets from the local bakery) I can just amend the soil as needed, and plant. All the work has really been done after getting up and running in the first place. 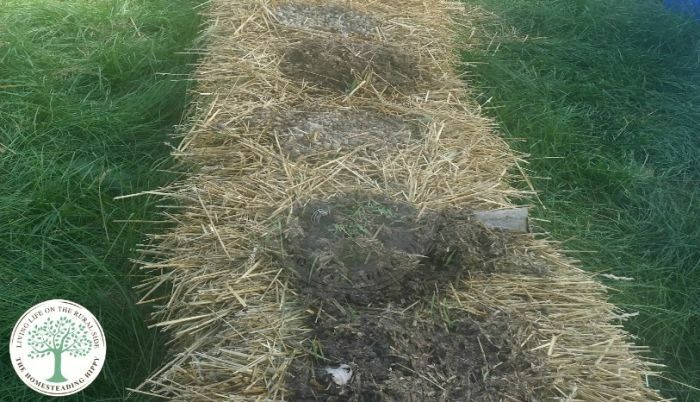 However, I can see where bales might be handy if I wanted to grow in an otherwise unusable area (like you mentioned), or use bales at a spot I intend to just till under since the straw/compost can just decompose in place. I may try this out after all – thanks!